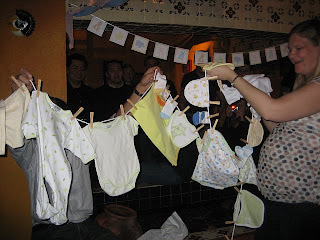 The gift hit of the day-my friend Lina bought TONS of little outfits and hung them on a 20 ft clothesline. Amazing! 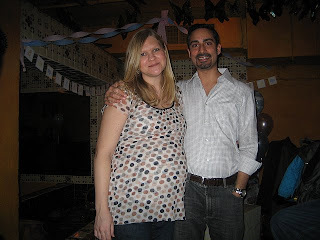 On Sunday we had our baby shower. I was amazed at how many friends and family attended and so glad to share my belly with everyone. I'm still overwhelmed with all the gifts we got (THREE Boppys!) and it makes Baby Monkeys future arrival so much more real. Shaina made the cutest 'diaper cake' and decorated cakes and made favors. It was all so nice and I think everyone enjoyed themselves. I know I did. One person in particular who enjoyed themself was mystery lady. ML arrived with some friends of the family who often bring relatives to events and we're never quite sure who they are. No problem, we had seats for everyone. After about a half hour I noticed ML was sitting amongst a group of our friends and not at the family end of the table. Henry called me over and asked who she is. I told him I think she's Rita's Mom or something. He wasn't so sure. Especially the way she was wolfing down chips and salsa. So I asked David, who asked his Dad, who asked Rita. Nope, not with Rita. Ok-so WHO THE HELL IS SHE? Turns out she was some homeless party crasher who thought she would just blend in with the guests. David's Dad said we should let her eat and enjoy. Um no, and then the next thing we know this lady will steal our stuff! So Matthew had the waitress 'remove' her from the restaurant. Upon being EXPOSED the lady responded 'Oh, I'm looking for the bathroom' and was escorted out of the place. At least it makes for a good story for years to come..."Remember that Creepy-party-crashing-homeless-leopard print hat wearing-crazy lady!" Afterwards we loaded up Shaina's car with gifts, some folks carried the rest home, and played some Wii and went out to dinner. I was totally exhausted by this time and we are just so thankful to have such wonderful friends and family. Thanks so much everyone! 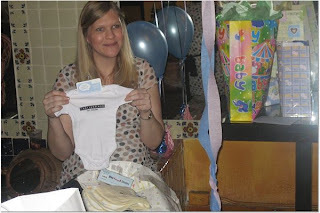 Sounds like a fantastic baby shower! That is a pretty funny story about the Mystery Lady. Can't believe it really happened, but like you said, it makes a good story. You and your belly look great!! 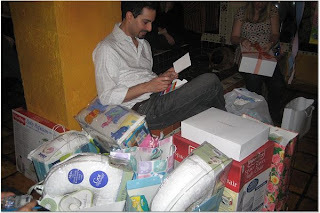 That a stranger would have the nerve to crash a baby shower is fantastic! 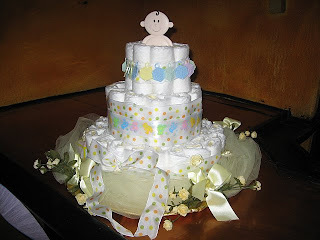 Your baby shower was a lot of fun. My very first one. 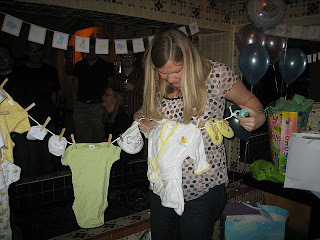 Although I was a little disaapointed that the mystery lady turned out to be a baby shower crasher and not a stripper. Not what I was expecting. And are there always so many breast related gifts?